Finding reasons to praise Game of Thrones isn't hard. The series continues to deliver the goods on all levels, from the acting to the writing, direction and music. And then there are the costumes. From a distance, they're gorgeous. 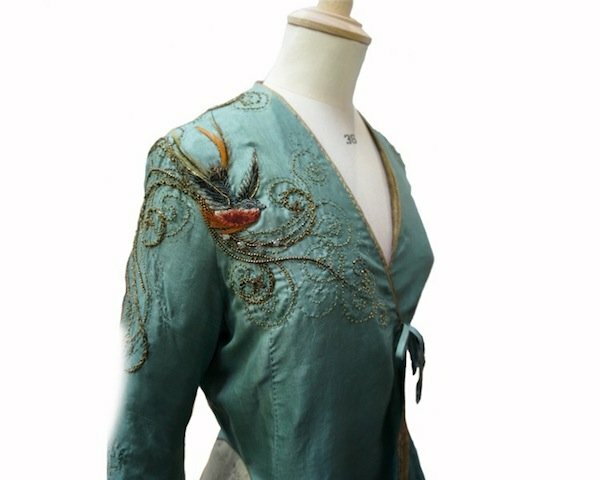 Up close, the word "stunning" comes to mind, particularly as it relates to the embroidery. Yes, I said embroidery. 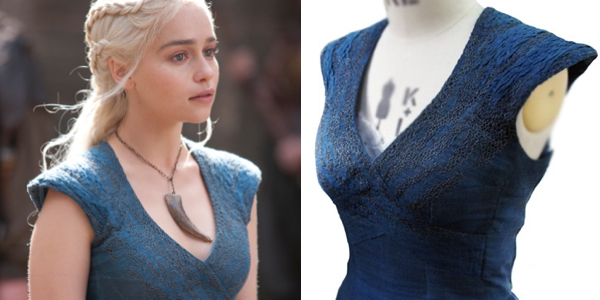 Rarely do I feel compelled to discuss it, but looking at some of the close-ups of the Game of Thrones costumes, it seems necessary to take a moment to appreciate the hard work and artistry that went into some of the clothing worn by the characters on the HBO series. 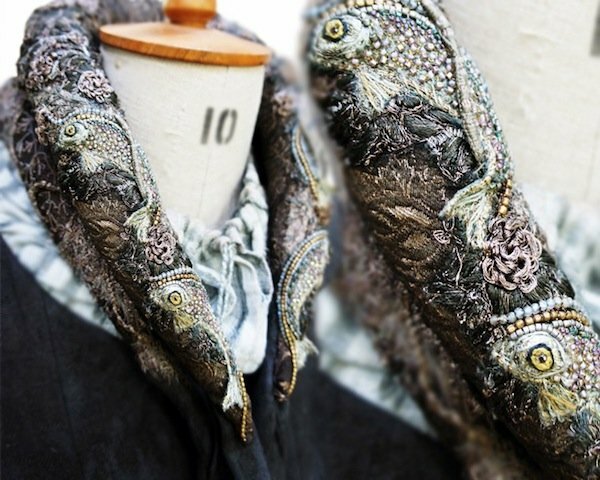 HBO has actually showcased costumes in online featurettes before, but these photos come (via MessyNessyChic.com) Michele Carragher's website and show off the impressive embroidery she's done on some of the costumes for the fantasy-drama. And here's a closer look at Sansa's wedding dress, which has an embroidered band that wraps around and uses symbols to tell Sansa's life story "from the Tully and Stark beginnings to the entanglement with the Lannisters." You can get a closer look at the dress here. At the lower back, there are Tully fish and Stark dire wolf. 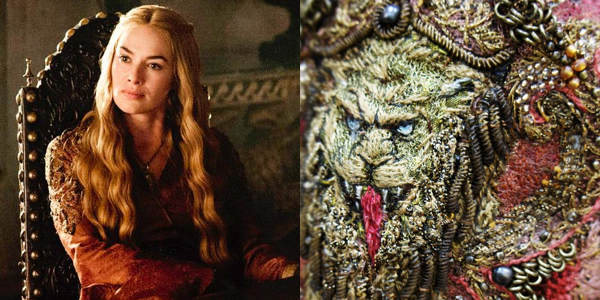 Then in the front there's the Lannister Lion, which Carragher says is becoming dominant over the dire wolf. Then up at the back of the neck, the Lion head is stamped onto Sansa, which I assume is the point at which she marries Tyrion. Who knew her dress said so much? 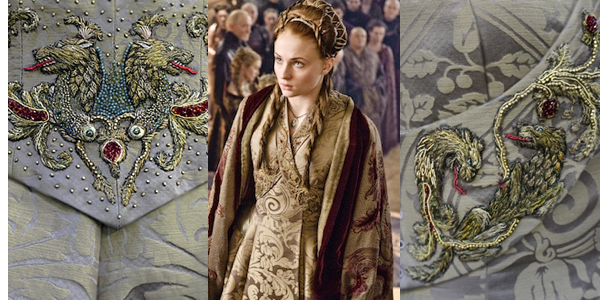 And these are just a few examples of the stunning work Carragher has done for the costumes on Game of Thrones. There are a couple more below, and even more at Carragher's website. 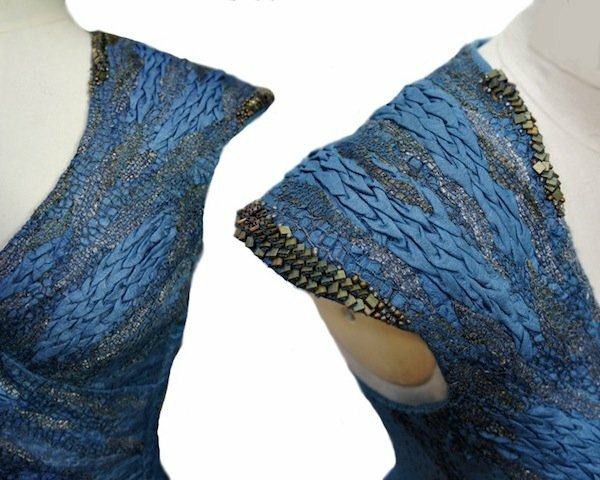 I really love this close-up look at Catelyn's collar and what appear to be little silver fish worked into the embroidery. She may have married a Stark, but she's a Tully through and through!